Structures of two phosphorus oxyacids. 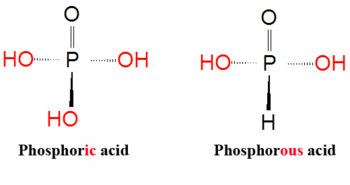 Phosphorous acid is a diprotic acid, not triprotic, because one of its protons is bound to the phosphorus atom. Phosphoric acid, H3PO4, most correctly called orthophosphoric acid but also called white phosphoric acid, is the most common of the phosphoric acids. It can be produced from the hydrolysis of its acid anhydride phosphorus(V) oxide, P4O10, also called tetraphosphorus decaoxide. Organic polyphosphates serve as energy reservoirs in living systems. It is severely corrosive and will cause burns on contact. In addition, it is incompatible with a wide variety of compounds with which it reacts in a very exothermic or even explosive fashion. Dangerous phosphorus oxides may be produced upon heating and decomposition. Phosphoric acid is a clear, colorless, odorless syrupy liquid that is miscible in all proportions with water, with a melting temperature of 21C and a boiling point of 158C. Phosphoric acid is a triprotic acid, in that all three protons can be dissociated. However, the third proton is not very acidic. The chemical formula can also be written as (HO)3P=O, which more clearly indicates that each of the protons is bound to an oxygen atom. Although salts can be produced incorporating each of the three anions, those formed with dihydrogen phosphate and hydrogen phosphate decompose upon heating, producing a metal trimetaphosphate,M3(PO3)3, and water. Phosphoric acid forms flammable gases with aldehydes, cyanides, chlorides,mercaptans, stainless steel and sulfides, and toxic fumes result in reactions with cyanides, fluorides, halogenated organics, organic peroxides and sulfide. Violent or exothermic reactions occur with alcohols, aldehydes, amides, amines, azo-compounds, carbamates, caustics, combustible materials, cresols, epoxides, esters, explosives, glycols, ketones, organic peroxides, organophosphates, phenols and unsaturated halides. It reacts violently with sodium tetrahydroborate. Living organisms store energy in the form of polyphosphates, which form in a dehydration reaction of phosphoric acid. Adenine triphosphate (ATP) and adenine diphosphate (ADP) are particularly important polyphosphates. Energy is released in cells upon the hydrolysis of each phosphate group. Thus, when ATP is enzymatically transformed into ADP, energy is released for use within the cell. The pyrophosphate (O3P-O-PO3)4- esters of dimethylallyl and geranyl play a central role in the biosynthesis of naturally occurring terpines. This page was last modified 04:27, 21 February 2010.